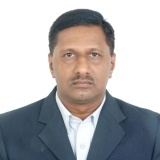 Mr. R Shivakumar is Vice President, Operations and Factory Manager. He has completed his Bachelor's degree in Mechanical engineering from Sri Jayachamarajendra College of Engineering, Mysore. He commenced his career with AAL as Graduate Engineer Trainee in 1985 and has worked in various departments like Manufacturing, Purchase and Supply Chain. He has been awarded Masters degree in "Engineering Business Management" in the year 2009 from the University of Warwick.